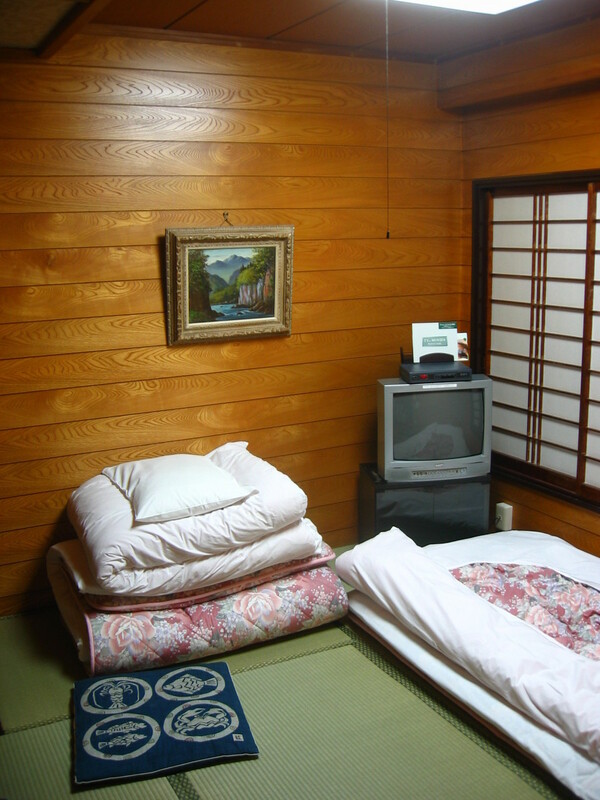 Over the week-end, we stayed at a Japanese-style hotel (i.e. 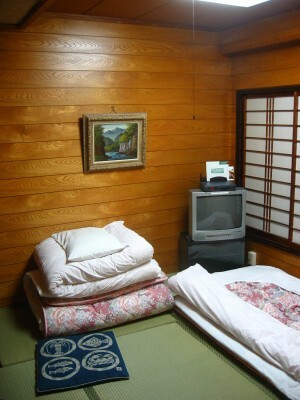 a ryokan): wooden walls, tatami on the floor, sliding paper panes, futons for sleeping, cups for green tea. But after a day of strolling around the city, even a coffin would have been a relief. 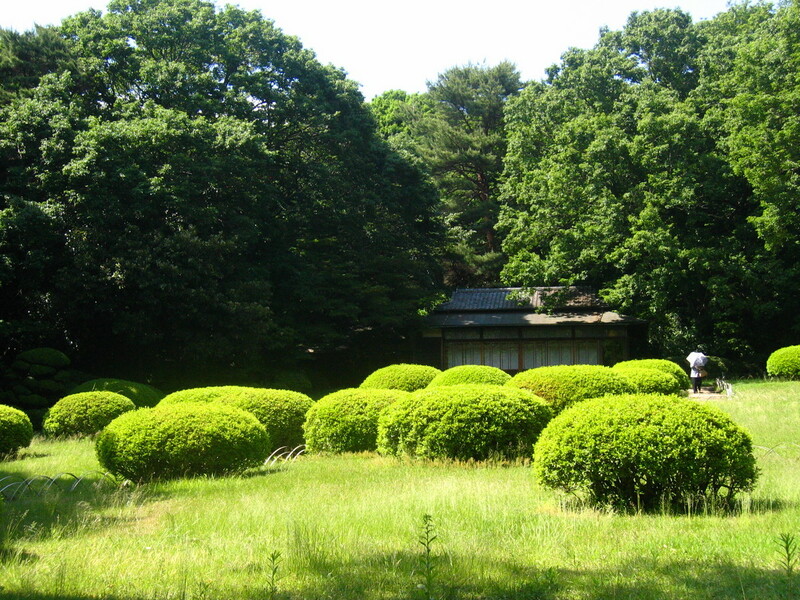 The ryokan was situate in Ueno, a ward in the North of the city. Small shops are still found there, as a trace of the post-WWII period when the place was a large black market, cut in two by the elevated railway. Further north-east lies Asakusa, where we headed for on Saturday. By chance, sanja matsuri was held that day, a traditional festival happening in and around the beautiful Sensoji buddhist temple. 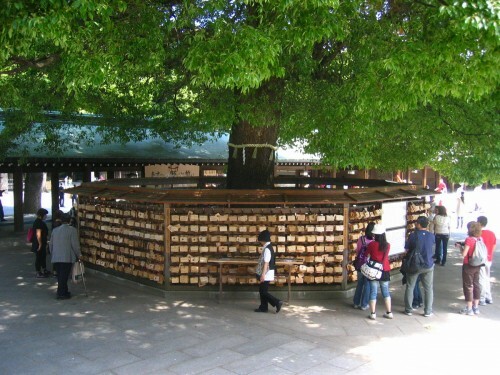 A hundred shrines were carried around the temple by men and women in traditional clothes, cheered by the crowd and musicians banging on drums. 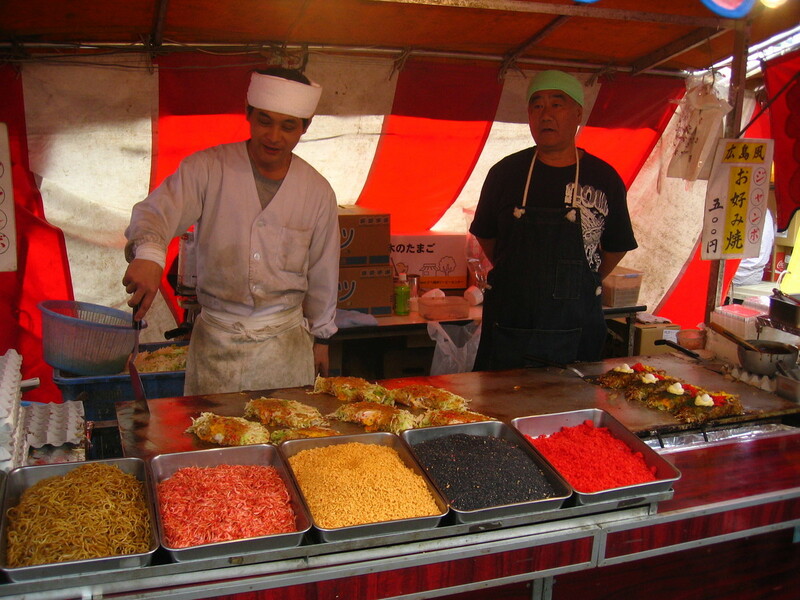 Many food stands had also been installed in the area. The Japanese equivalent to cheap hotdogs and French fries looked healthier — like all the food we eat there in general. The tourist/natives ratio hovered way above the level we were used to in Ōsaka, and it remains true everywhere in Tōkyō. Not really surprising given how fashionable it is abroad, yet it still did feel weird after having been so isolated. Later on that day, we visited Akihabara, also known as Akihabara Electric Town. If you can picture yourself walking in an area filled with hundreds of small computer and electronics shops, stacked against each other along a large noisy street, you don’t need to go there anymore. Or maybe you do, to satisfy the otaku in you. Alternatively, you can check out the musical instrument stores in Ochanomizu. Mostly guitar shops, though, and I was both disappointed and relieved not to find any keyboard store. Disappointed, because they’d probably have crazy rare analog synths; relieved, because I would not have to elaborate a plan to fit a Mellotron in my 20-kg suitcase on the trip back. Tōkyō is not short of traditional places, however, and we then headed for Yasukunijinja Shrine, a beautiful temple slightly further North, after which we were right on time for our meeting in Jumbōchō. 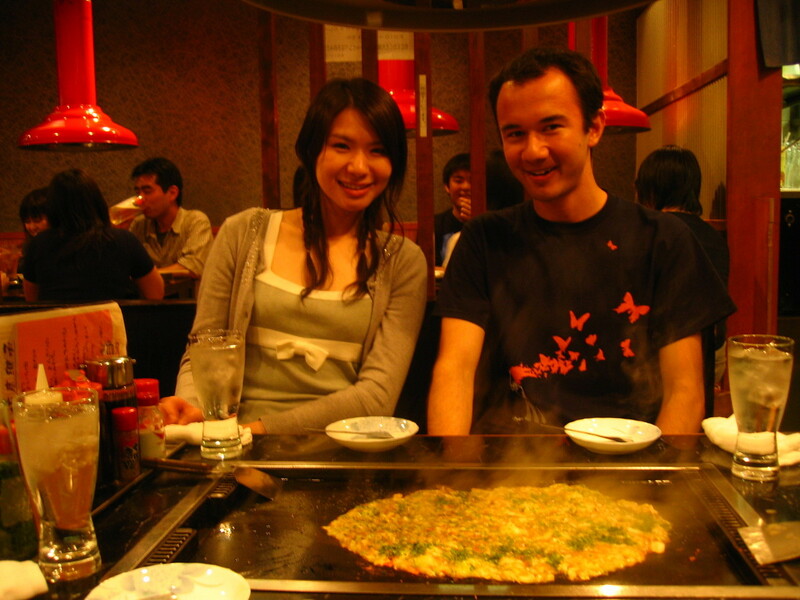 My korridormate from Sweden, Yumeko, just moved to Tōkyō a few days earlier, so it was a great occasion to meet again! We had a cup of kōhii, walked a bit in Ginza and set off to Tsukishima to eat monjayakis, the Tōkyō version of okonomiyakis. A cooking plate is embedded in the table and you’re left to yourself to prepare, mince and cook your Japanese omelette. A delicious meal, which ended this busy but satisfying Saturday. Sunday morning, we woke up early to go to Ryogoku Kokugikan: the sumo wrestling arena! 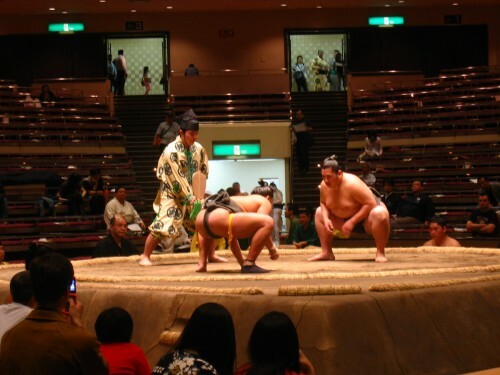 Unlike most of the standard sports which involve hairy amphetamine mountains running after various irrelevant objects, sumo wrestling tournaments are only held a few times a year. 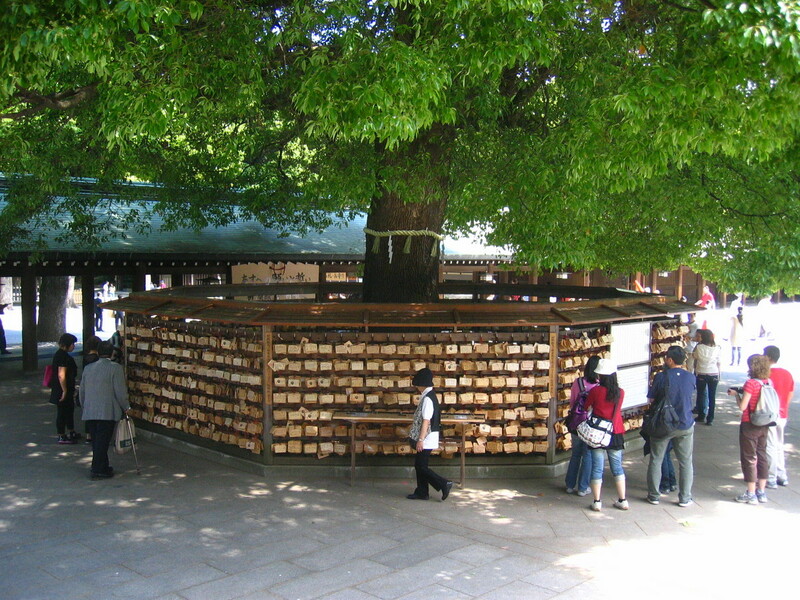 Three times in Tōkyō, and one each in Ōsaka, Nagoya and Fukuoka. This sport still carries the legacy from its Shinto origins. Unfortunately, we arrived early to find a seat and we missed the most ceremonial part, which happens in the afternoon. 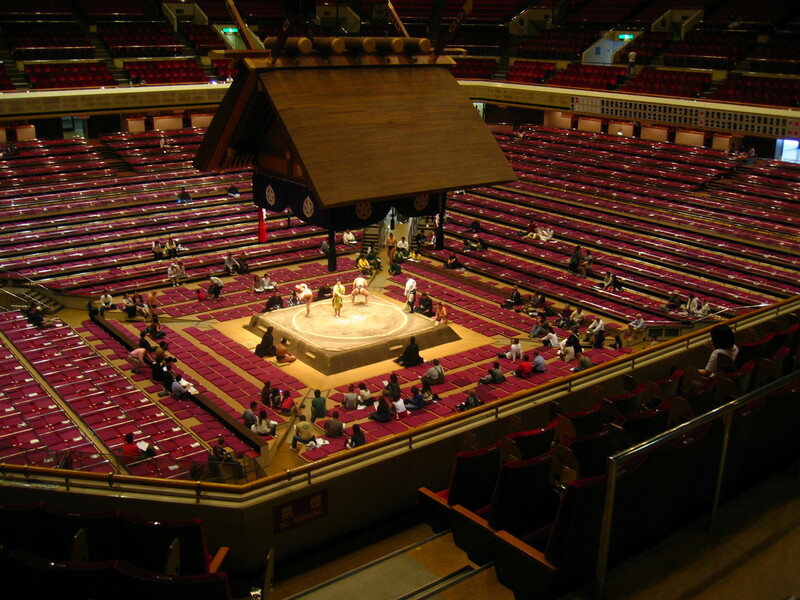 Nevertheless, even the early matches had their little ceremony: a referee (or gyoji) first enters the ring to call out the names of the combatants by singing them in a high-pitched voice. The wrestlers then come up and bow, practice precise moves, show the gods that they conceal no weapons and bang the floor with their feet to symbolically drive evil away from the dohyo. 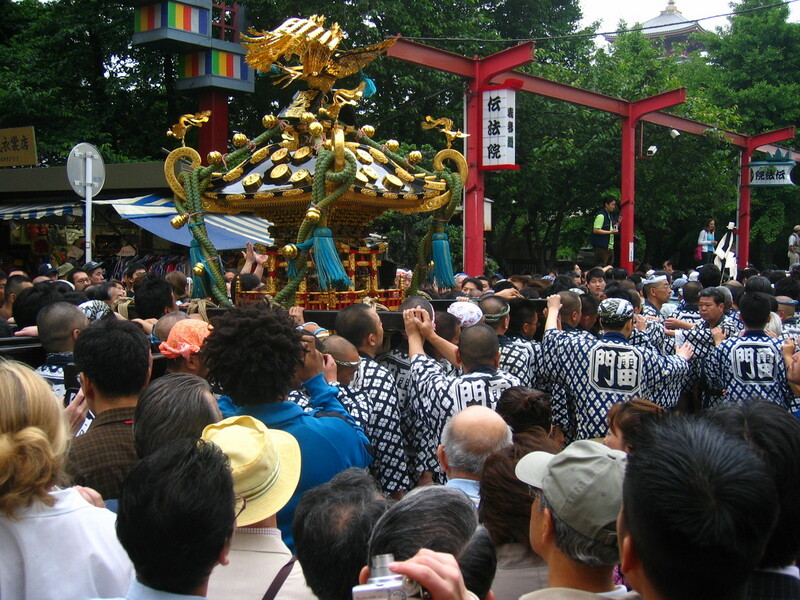 The multiple referees all wear traditional clothes, from black to colored costumes similar to priests’ kimonos. All highly codified and fascinating to watch. 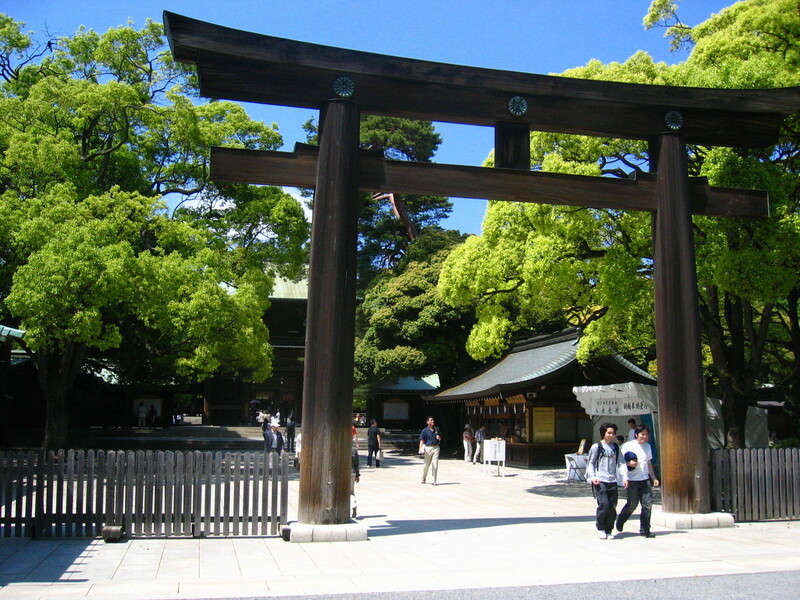 To contrast with ancestral tradition, there was no better place than Harajuku. The bridge next to the metro station is famous for being a meeting point for cosplayers, i.e. people dressing up like anime, manga or video game characters. In reality, there were only girls, who wore exuberant fashion costumes, and paraded on the bridge to be photographed by passerbys. A hyper-contemporary, almost surreal vision. A few minutes away, in the middle of the forest, stands the Meiji Jingu Shrine, and a beautiful traditional garden where the empress used to come and fish. 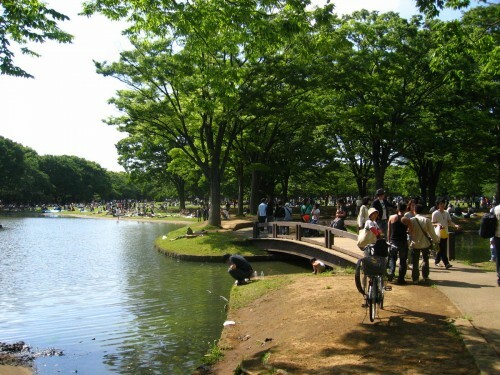 Further South, the Yoyogi Park was busy with a crowd coming there to relax, sing, play mandolin, dance, etc. 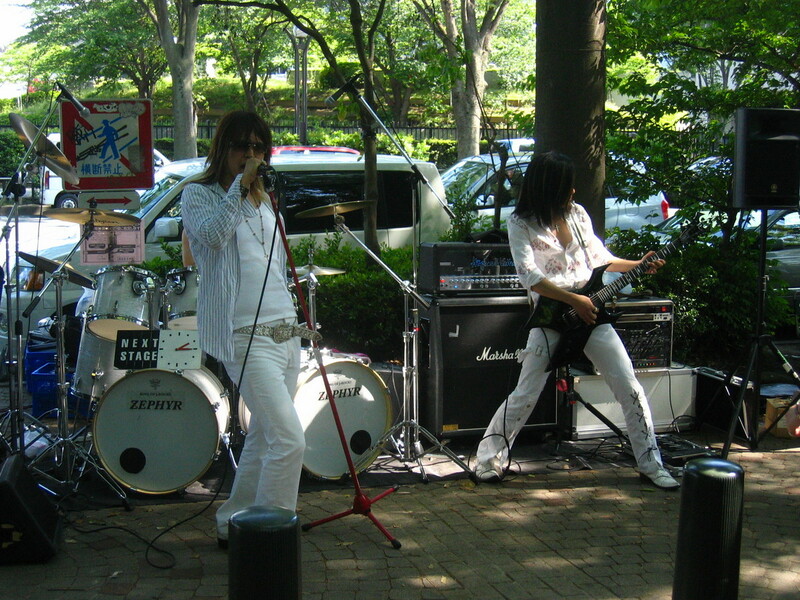 Along the road, indie bands demonstrated their skills in various genres, from rock to emo-pop. You could even find nostalgic rockabillies defying the heat with tight leather trousers, dancing tirelessly. At that point, our curiosity gauge slowly dropped under our fatigue threshold, which prompted us to start backtracking to Ōsaka. 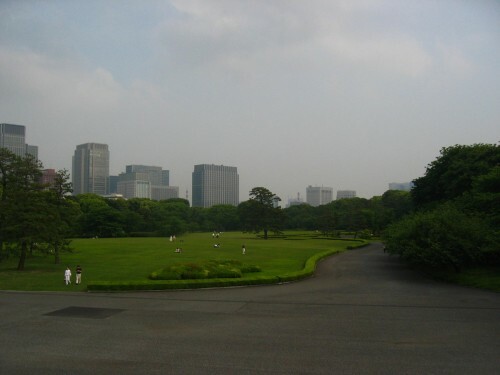 A few metros and Shinkansen later, we arrived to our respective apartments and tediously caught up with reality. One which included waking up the next morning to go to work, and to serialize the experience in a series of hopefully exciting blog posts. That’ll be all for the trip recounting, but expect other posts about this endlessly rich experience! Addendum: Bao-Lan has also posted (in french) about our trip.